Others up for multiple surfboard-shaped trophies include the CW's "The Vampire Diaries" with six nominations, and Fox's "American Idol" and Justin Bieber with five nods each. 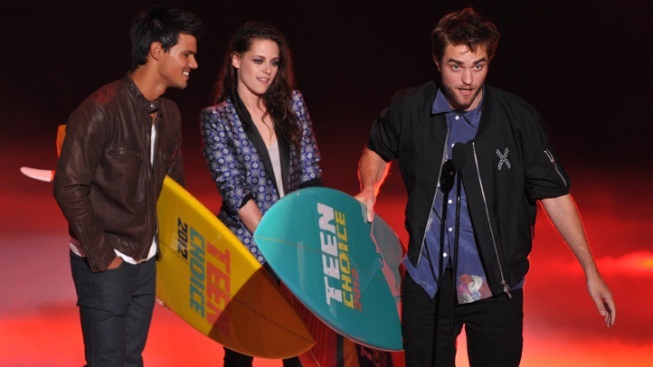 Taylor Lautner, Robert Pattinson, and Kristen Stewart walk onstage to accept the ultimate choice award at the Teen Choice Awards in Universal City, Calif.
"The Twilight Saga" is gonna need a bigger garage. It was announced at Sunday's Teen Choice Awards that the supernatural franchise has won 41 surfboard-shaped trophies since 2008, including two awards earned this year for the penultimate film installment, "The Twilight Saga: Breaking Dawn — Part 1." "Twilight" stars Kristen Stewart, Robert Pattinson and Taylor Lautner were on hand to pick up this year's batch of boards, which included the ultimate choice award, the teen-fueled show's version of a lifetime achievement award. "It's amazing you guys are still around and just as strong and just as loyal," Lautner said over screams from the crowd. Stewart was honored as the choice romance movie actress for "Breaking Dawn — Part 1" and as choice female summer movie star for "Snow White & the Huntsman." Other multiple winners included the movie "The Hunger Games," actress Emma Stone, TV show "Pretty Little Liars," the British boy band One Direction, CW show "The Vampire Diaries," and singers Justin Bieber and Taylor Swift, who picked up her 20th trophy — the most ever won by a female artist. "I just feel so honored that I get to have you guys in my life," a beaming Swift told fans. Swift won five awards Sunday: choice female artist, female country artist, single by a female artist for "Eyes Open," country song for "Sparks Fly" and choice movie voice for "Dr. Seuss' The Lorax." Host and new "The X Factor" judge Demi Lovato said 134 million votes were cast for the 14th annual awards, which honor film, TV, music and sports stars in such silly categories as choice hottie, villain, lip-lock and hissy fit. "Are there even that many teens?" asked ceremony co-host and "Glee" actor Kevin McHale. 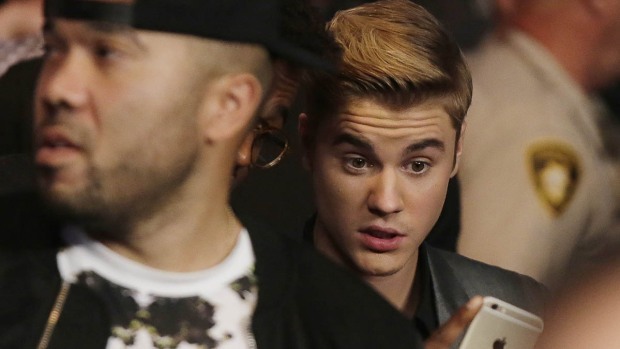 Bieber performed his tune "Boyfriend" and surfed away with five boards, bringing his Teen Choice Awards total to 12 trophies. His girlfriend and birthday girl Selena Gomez won the choice music group trophy and was presented with a cake and rendition of "Happy Birthday" from the crowd inside the Gibson Amphitheatre. Other winners on hand to accept their awards included Ellen DeGeneres for choice comedian, Zac Efron for choice drama actor and drama movie for "The Lucky One" and Jonah Hill for choice comedy movie for "21 Jump Street." Hill, who lost the supporting actor Oscar earlier this year to Christopher Plummer, used his acceptance speech to poke fun at the 82-year-old "Beginners" co-star. "I'd just like to point out that he's not nominated for anything tonight," joked Hill, who co-wrote and executive produced the movie. The Hollywood frolic was televised live on Fox just two days after the midnight massacre at a Colorado movie theater showing "The Dark Knight Rises," killing 12 and injuring 58. The movie wasn't up for any awards nor was there any reference to the tragedy during the show. "I was devastated when I heard," said Lovato on the red carpet before the show. "It is just really horrible that we can't even feel comfortable going to the movie theater, and that extra police have to be at movie theaters now. It is just really sad that our world has come to that." The Teen Choice Awards also aired in the wake of a fog machine malfunction that forced the evacuation the night before of a Hollywood nightclub that hosted a Teen Choice Awards pre-party featuring the boy band Midnight Red. Los Angeles Fire department spokesman Brian Humphrey said six people, ages 8 to 20 years old, were taken to the hospital for problems ranging from headaches, dizziness, shortness of breath and cryogenic burns.